R-68 no. 2894 on the "B" line, BMT Brighton Line at Beverley Road. Photo by John Dooley, August 2011. The Brighton Line began service on July 2, 1878 as the Brooklyn, Flatbush, and Coney Island Railroad, between Prospect Park and the Brighton Beach Hotel as a surface steam railroad. (The Brighton Beach Hotel was owned by the railway.) It was extended on August 19, 1878 at the north end to Atlantic Avenue and Franklin St. (now Franklin Avenue), where it connected with the LIRR mainline. The LIRR, however, owned the competing Manhattan Beach RR, and terminated the trackage right agreement in December, 1883. The BF&CI was then reorganized as the Brooklyn & Brighton Beach Railroad in 1887. After losing its connection to the LIRR, the Brighton line began negotiations with the Kings County Elevated Company to route its trains downtown via the Fulton Street El. Through service began on the Fulton El in 1896. Around the same time, the Brighton Line was electrified using trolley wire from Fulton St & Franklin St to Newkirk Avenue, and then to Brighton Beach in 1899. In 1900, the Kings County El took control of the Brighton Line. When the Fulton St El was electrified, a ramp to the Brighton Line at Fulton & Franklin was built, and through trains to Park Row, Manhattan, via the Brooklyn Bridge began on July 9th, 1900. By this time, the Brighton Line was more than just a small railroad serving seasonal customers; it became a bona-fide mass transit line carrying thousands of Brooklynites to their jobs in downtown Brooklyn and lower Manhattan. By 1900, through a series of mergers and acquisitions, the Brooklyn Rapid Transit company has gained control the Kings County Elevated (and the Brighton Line), along with almost every other railroad, elevated and streetcar line in Brooklyn, with the exception of some LIRR routes. 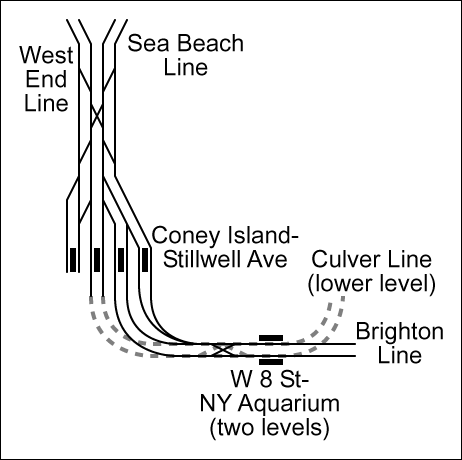 In 1903, a short extension on the surface connected the Brighton Line with the Culver Terminal in Coney Island. Between 1905 and 1908, the BRT performed a major upgrade to the Brighton Line, building much of its present right of way. The line was elevated from the Fulton El connection at Fulton and Franklin, then ran in an open cut from north of Prospect Park to Newkirk Avenue, then ramped up to an embankment to Sheepshead Bay, where the line descended to the surface for the last section to Coney Island. Between Church Avenue and Sheepshead Bay, there were four tracks. During the "Dual Contracts" period of subway construction, the surface-running section from Sheepshead Bay was elevated and increased to four tracks. The first section, between Sheepshead Bay and Ocean Parkway, opened on April 22, 1917. It was extended to West 8th Street on May 30, 1917, and to the new Stillwell Avenue terminal on May 29, 1919. At the other end of the line, the section between Church Avenue and Prospect Park was increased to 4 tracks, opening on September 26, 1919. In 1918, the connection to the Manhattan Bridge via subway was not yet built, and the line between Fulton/Franklin and Prospect Park was not yet improved to Dual Contracts standards. Hence, the new steel Standards introduced on the Sea Beach line could not run along the Brighton Line, and service was comprised of the older wooden El cars. It was five of these wooden El cars that were involved in the Malbone Street wreck of November 1st, 1918. The last major addition was the opening of a new subway tunnel, August 1, 1920, under Flatbush Avenue connecting the Brighton Line at Prospect Park with the 4th Avenue Subway at DeKalb Avenue, thus providing the Brighton Line with a connection to the Manhattan Bridge and Montague Street tunnel lines and the Broadway (Manhattan) subway. When this connection was put in place, through service from Franklin Ave & Fulton Street was ended. Two services then traversed the Brighton Line - the #1 line between Astoria from Coney Island and the #7 line between Fulton/Franklin and Brighton Beach during the summer and Fulton/Franklin and Prospect Park at all other times. In 1955, Franklin/Brighton service was reduced from daily during the summer to "sunny summer weekends and holidays" only. In 1963, the summer specials were completely discontinued. When the connection to the subway was made in 1920, Brighton Line trains ran either via the Montague St tunnel or the Manhattan Bridge to the BMT Broadway subway for 57th St - 7th Avenue or Queensborough Plaza. Later service was extended to Astoria. Theater Service was provided on the Brighton Line until the late '50s. It ran as the 'via Bridge Local' night service. Until the late 50s, the Brighton Express ran Mon - Sat, AM rush through early evening (around 7pm). From about 7pm to around midnight, the 'via Bridge Local' or 'Theater Specials' ran local, via bridge, 57 St. to Coney Island. After midnight, the Brighton Locals ran via tunnel. There used to be a timed GT-signal north of Avenue "H"; it disappeared when that portion of the line was resignaled. It was originally put there because of a rear-ender just north of that spot in the '60s (can anyone confirm?) There was also an accident nearby 30 years before, in 1932, where an electric locomotive was hauling flat cars loaded with track ties on the north-bound express track. An employee on the train noticed some of the ties had shifted. Instead of stopping the train, he attempted to stabilize the ties himself, while the train descended the grade. Some ties fell off one of the flat cars while the train was passing through Newkirk Avenue station. Several passengers were knocked down, some seriously injured. Legend says that there are supposed to be a few "dings" in the steel columns at Newkirk as a result of this accident. The R27 and R30 cars ushered in BMT letter markings when they debuted in 1960-61. Once the R-27/30s had arrived in sufficient numbers, they provided all weekend service on the Southern Division. Come Monday morning, the BMT standards and Triplexes were back out in force. Triplex units running on the Brighton line displayed the numeral "1" regardless of whether they ran local or express. The letter marking system was first implemented as follows: Brighton express trains were designated with the letter Q; during the mid-60s they ran on weekdays only. Brighton locals running via the Montague St. tunnel carried a QT marking and ran during the same hours as the Q (Monday-Friday approx. 6:00AM-7:00 PM); the QB operated all by itself during nights and weekends via the Manhattan Bridge and made all local stops. This letter code coexisted with the older number markings on the Southern Division until the Chrystie St connection opened up, where all number markings were officially dropped and letter markings were adopted on the BMT lines. On November 26, 1967, the Chrystie Street connection between the Manhattan Bridge and the IND 6th Avenue subway opened, forcing some change on nearly every former BMT line. Brighton Line service consisting of "D" trains began operating from 205th St and Bainbridge Avenue in the Bronx, via Grand Concourse, Central Park West and new 6th Avenue express tracks over the north side of the Manhattan Bridge to Brighton Beach. QB trains ran during the rush hours from about 7am to 8am and then again from 5:30pm to 6:30pm via Brighton Local and the south side of the Manhattan Bridge to 57th St - 7th Avenue, starting in Coney Island. QJ trains also ran via the Brighton Local from Coney Island via the Montague Street tunnel and Broadway Brooklyn El to 168th St in Jamaica, Queens. Also debuting in 1967 was the NX super-express. It ran from Brighton Beach to Coney Island- Stillwell Avenue, then non-stop via the Sea Beach express tracks to the 4th Avenue subway at 59th Street. An incredible run for railfans, it was discontinued in 1968 due to lack of ridership. In 1976, M trains replaced QJ trains between Coney Island and Metropolitan Avenue in Queens during weekdays. Whenever the M was not running, the D train picked up the slack and ran local over the Brighton Line. In 1982, work on the north side of the Manhattan Bridge caused some unusual reroutings. D trains running from the Bronx switched to the local tracks at Broadway - Lafayette. From there the train ran non-stop to DeKalb Avenue as follows: using the connection to Essex Street. D trains stopped at Essex, where a spare motorman took over and the D train motorman walked to the opposite end of the train. The train would then proceed about 20 car lengths onto the Williamsburg Bridge and reverse direction back into Essex Street where the spare motorman would get off the train. D trains then ran via the Nassau St. Loop and Montague St. tunnel to DeKalb Avenue, where travel resumed up the Brighton Line. Other than the K and KK services which ran on this part of the Chrystie St. connection, this D train routing was the only other time since then that revenue service was seen on these tracks. In the mid 1980s, split D services were utilized during this track work, ending with the opening of the 63rd St tunnel to Queens. D trains from Brighton Beach ran via the BMT Broadway Line to 57th St and B trains ran via the Broadway subway to Astoria. D trains from the Bronx ran to 34th St - 6th Avenue, where connections could be made to D trains to Brighton. A shuttle ran between 57th St and 6th Avenue and Grand Street, Manhattan, to cover portions of the route not serviced by this split service. In 1988, as part of the Archer Avenue & 21st - Queensbridge subway openings (and temporary Manhattan Bridge work), the M train was rerouted to the West End Line and the D became the Brighton Local at all times. The former D Brighton Express was replaced by the Q train, which ran express between Brighton Beach and 21st - Queensbridge during weekdays. In 1994 and 1995, the Brighton Line saw extensive rehabilitation. Welded rail was laid on both the local and express tracks. A new signal system started working in 1996. Station canopies were likewise rebuilt. (New station lighting was installed during the 1980s). While some veteran observers had expected the Brighton Express (Q train) to be extended to the Queens Boulevard line's 71-Continental Av Station once the 63rd Street Connector project was completed, the MTA did not do so. However, the restoration of four-track Manhattan Bridge service in the summer of 2004 promises to bring significant changes to this as well as other lines. After the bridge reopened the Brighton line ended up with Q local service via Bridge and Broadway express, and B express service via bridge and 6th Avenue express. See the Manhattan Bridge page for details of bridge service. The "unusually long" bridge abutments on the east side of many of the avenue crossings along the Brighton Line embankment. Some of the houses built along East 16th Street use these abutments to support backyard porches! An abandoned tunnel or flying junction at Avenue X which was part of the R.O.W.of the BRT - Sheepshead Bay Race Track At Gravesend Neck Road & East 16 Street, there are blocked up "stairways to nowhere". At one time, they led to the Neck Road station of the LIRR Manhattan Beach line The widely-spaced stairways would seem to indicate side platforms. The stations of the DeKalb extension are in subway. DeKalb Ave, Atlantic Ave and 7th Ave were all built using the cut and cover method. The tunnel under Flatbush Avenue between 7th and Atlantic is actually shared by both the Brighton Line and the IRT Eastern Pkwy line in that area. The IRT tracks straddle the two former BMT tracks of the Brighton Line, and in fact, the IRT tracks can be seen through a gap in the southbound Brighton Line wall. The tunnel between 7th Avenue and Prospect Park appears to be "deep bored" beneath Propsect Park. On the open cut portion of the Brighton Line between Prospect Park and Newkirk Ave, Prospect Park, Church Avenue and Newkirk Ave stations are four track, two island platform express stations. Parkside Ave, Beverley Road and Cortelyou Road are local stations. Cortelyou and Beverley Roads are one block apart! They also seem to have been carved into the walls of the open cut, while Parkside Ave. is a bit more squared off. On the embankment section between Avenue H and Sheepshead Bay Road, Kings Highway and Sheepshead Bay Road are four track, two island platform express stations. Avenues H, J, M, U and Neck Road are narrow, local stations with ornate ironwork in the overhead canopies. On the elevated portion between Neptune Avenue and Stillwell Avenue, the Brighton line boasts the only 4 track "alley" elevated on the entire system. Brighton Beach is a 4 track, 2 island platform express (terminal) station. West of Brighton Beach, the elevated structure contains 6 tracks - 2 local, 2 "express" and 2 storage tracks (although the "express" tracks are used as storage tracks, too). Ocean Pkwy is a four track, two island platform station with the structure over Ocean Pkwy encased in concrete. The El is reduced from 4 tracks to 2 and rises to become the upper level of West 8th St. It should be noted that Brighton Locals used the lower level of the El structure into the lower level of West 8th until 1954, when the IND was connected to the Culver Line at Ditmas Ave. West 8th is a double level El with 2 side local platforms. From there the El is double-leveled into Stillwell Avenue. From a railfan's perspective, the Brighton line is a delight. Excellent photo opportunities abound, especially on the elevated portion between Brighton Beach and Stillwell Avenue. One particular good photo spot is West 8th Street from the street. Specifically, a perch on the pedestrian bridge leading to the New York Aquarium right over Surf Avenue gives you the opportunity to photograph Brighton Line trains leaving at the top of a double-El structure, and Culver Line trains from the lower level of the structure. From the Coney Island bound upper platform, a great view of the Culver Line to the Belt Pkwy can be seen to the north. Another good photo stop is the southbound (Brighton bound) Beverly Road station. If you stand at just the right point of the gently curving station, you can get a great shot of trains leaving Church or Newkirk Avenues. If you have a camcorder, some great run-bys can be had at this location. 1912: Under BRT (New York Conslidated Railroad) control. 1963: Brighton/Franklin service, reduced to summer weekends / holidays only from daily during the summer, is eliminated. 1968: NX service discontinued due to lack of ridership. 1976: M trains replace QJ trains as Brighton Local. 1988: D trains become Brighton Local; Q trains become weekday Brighton Express. 1995, May-November 3: The North Side of the Manhattan Bridge is closed for construction except rush hours and weekday late nights. D Trains run between Norwood-205 St & Coney Island rush hours and weekday late nights only. Brighton/6 Av Q Express Service runs rush hours only. Weekday middays & all weekend, the D runs between Norwood-205 St, Bronx & Herald Square-34 St only, while the yellow circle Q runs between 21 St-Queensbridge & Coney Island via 63 St/Broadway Express/Lower Manhattan/Montague St Tunnel & Brighton Local. 2001: Due to Manhattan Bridge work, two Q services are operated via Broadway and south side of bridge; yellow-circle Q local, yellow-diamond Q express, both terminating in Manhattan at 57th St.
2001, September 19-October 28; World Trade Center tragedy extends Brighton local Q trains beyond midtown Manhattan, 57 St/7 Av to Forest Hills-71 Av (replacing the suspended R train) via 60 St/Queens Blvd Local, except late nights. Q Diamond Express runs normal between Midtown-57 St/7 Av & Brighton Beach. On October 28, Q Service resumes its normal route to/from Midtown-57 St/7 Av; R service is resumed. 2002, September 8: Reconstruction of Stillwell Ave. Terminal requires Q Service to be cut back to Brighton Beach. 2004: Manhattan Bridge reopens, services operated are yellow-circle Q local via bridge-Broadway express and orange circle B express via bridge and 6th Avenue express. 2004, May 23: Stillwell Terminal reconstruction ends short turns of Q service; Q service is extended back to the newly reconstructed Stillwell Av Terminal, with the opening of the Ocean Parkway & West 8 St-NY Aquarium Stations. 2008, July 29: R160B's began operation on the Q Train on July 29, 2008. By the end of 2009, the R160s and R68/R68As are the only fleets seen on the Brighton line (save one or two occasional sets of R32s). 2008, December 8: Brighton Line Station Reconstruction Project begins. The Coney Island-Bound Side of the Avenue U & Neck Road Station's are first to be closed off to Q Trains. All Southbound Q Trains run on the Express Track between Kings Highway and north of Brighton Beach. Passengers are forced to use the B3K Bus at the Kings Highway Station for Avenue U, or transfer at Sheepshead Bay to a Manhattan-Bound Q Local stopping at Neck Road & Avenue U. 2009, September 28: The Brighton Line Station Reconstruction project continues, closing the Coney Island-bound side of the Avenue H, Avenue J, & Avenue M Stations. Brighton Express B Service is suspended until Fall 2011. The closing of these stations, and the southbound local track forces all southbound B/Q trains to run on the express track. Southbound B/Q local service is normal between Prospect Park and Cortelyou Road. Upon leaving Cortelyou Road, the southbound local track gently connects with the southbound express track. No switch was installed between the local and express tracks, so bumper blocks have been installed at the end of the southbound express track (which now ends at Cortelyou Road), and the beginning of the southbound local track (which begins about 100 feet south of the southbound Cortelyou Road platform). Trains run on the express track between just south of Cortelyou Road, and north of Brighton Beach. Trains stop at Newkirk Av, the temporary Avenue J platform (that sits on the Mantattan Bound-Express Track), Kings Highway (southbound platform is closed; new temporary platform is built over the Manhattan-Bound Express track, and is pressed together with the normal northbound platform), and Sheepshead Bay. Weekdays, Coney Island-bound Q trains then switch over to the Coney Island-bound local track just before entering Brighton Beach, and run normal to Coney Island. B trains head straight into the normal Brighton Express Tracks at Brighton Beach to terminate. Weekends, Coney Island-Bound Q Trains remain on the Southbound Express Track straight thru Ocean Parkway. During this time, Trains continue to skip Avenue U & Neck Rd. 2010, January 18: The Coney Island-Bound Side of the Avenue U & Neck Road Stations Re-Open. The Manhattan-Bound side of the Avenue U & Neck Road Stations are now closed. Southbound B/Q trains continue to run on the Express track between just south of Cortelyou Road, and north of Kings Highway. After leaving Kings Highway, the B/Q Switch over to the Coney Island-Bound Local Track. Upon entering Brighton Beach, Q Trains remain normal on the Local Track, while B Trains switch over from the Local track to 1 of the 2 Brighton Express Tracks to terminate in Brighton. Manhattan-Bound B/Q Trains run on the Express track between just North of Brighton Beach, and just south of Kings Highway. Weekends, Manhattan Bound Q Trains run on the Manhattan Bound Express Track between Ocean Parkway, and South of Kings Highway. The B3K Bus now operates during the AM hours only to transport Avenue U Station Customers to Kings Highway for Manhattan-Bound B/Q Service. At the Brooklyn end of the Manhattan Bridge, both sets of bridge tracks, plus the set from the Montague Street Tunnel, feed into the massive DeKalb Avenue Station, which opened as part of the BMT Brighton Line subway construction on September 6, 1915. DeKalb Avenue is a six-track station, in an unusual configuration of local-express-super express tracks. There are two island platforms, with a track on each side, plus two more tracks down the middle, which do not have a platform face. There are north and south mezzanines with fare control and an active interlocking tower in the center platform crossover. Mosaics are limited to a large "DeKalb" name tablet. This station was extensively rebuilt in the mid 1950s by cutting off about 20m off of the south end and extending the north end by about 80m. The north end of both platform extensions are split with the "express" portion being lower than the "local" portion as the express tracks descend to the Montague St. tunnel. The north end exit was built as part of the extension as well. At the north end of the original station, where the 1950s extension begins, is a switch well between the 'tunnel' and 'bypass' tracks. The switch, removed with the rebuild of the 1950s, crossed trains from the both the bridge and bypass tracks (heading uptown) to the tunnel track. Symmetrical switches was on the downtown side. The switch plant was removed during the station extension. There is the remains of a turning loop, a larger version of the City Hall loop on the IRT East Side line, in the tunnel between DeKalb Avenue and Manhattan Bridge. It diverts from the uptown north side track and rejoins onto the downtown south side track. The loop passes under all four bridge tracks. It's likely that the loop was never actually finished with trackwork. The theory is that when DeKalb Avenue was built there was still uncertainty about the placement of lines on the Manhattan side of the bridge (which resulted in some changed plans on the BMT Broadway line and the disused lower level of BMT City Hall). Trains would not cross the bridge for lack of connections on the far end. So this loop was designed in order to get some subway service going in Brooklyn. When the Manhattan lines were sorted out and connected to the bridge, the loop plan was no longer necessary. Currently, the services operating on the Brighton Line via the Manhattan Bridge use the local-side tracks, and the services operating on the 4th Avenue line via the Montague Street tunnel use the express tracks (with platform). West End and Sea Beach services use the center bypass tracks. Service south of DeKalb Ave. is operated via the BMT Brighton Line and the BMT 4th Avenue Line, with further service along the BMT West End Line and the BMT Sea Beach Line. For detail of the track configuration in this area see the DeKalb Area track map. Two tracks, island platform. Mosaics are present indicating "To Hanson Place and LIRR" as well as name tablets. However, much of the station walls have no tile, reportedly damaged during and removed after an early flooding occurrence. The support columns here are concrete rather than exposed I-beams. There are multiple exits from the north end of the station, and the platform level still has old-style station name and directional signs. The fare control is up two flight of stairs with an intermediate landing level. A long, narrow passageway leads to the Pacific Street station on the BMT 4th Avenue line, which has multiple levels separated by stairs. It is to be made ADA compliant when the mezzanine at Pacific St. is redone as part of the larger Atlantic Avenue rebuild project. For many years this passageway was divided along its length by a fence to separate LIRR riders from subway riders. Fare control rearrangement in the 1970s opened the passage to free transfer between the subway lines, and in the early 1990s the fare controls were shuffled again to allow LIRR riders to pay their fare as they leave the LIRR platforms. The dividing barrier was then removed to allow open range over the full width of the corridor. Two tracks, two wall platforms. Mosaics for 7th Avenue and the numeral 7 are found. A full mezzanine exists over the station but it is half-blocked off. A closed exit near the center of the platform leads into the closed portion of the mezzanine. A free crossover is provided at the north exit via the mezzanine. From the open portion of the mezzanine, you can observe where the closed section is grilled off. On the platform, the narrow space between the two sets of exit stairways is also grilled off, apparently as a crime-control measure. At the far north end of the inbound side platform, there is a break in the tunnel wall where one can view IRT trains in the parallel IRT Brooklyn Line tunnel. Four tracks and two island platforms. The center "express" tracks are used by the Brighton Line trains to/from Manhattan and Coney Island. The station's north end is unusual due to split level platforms: the express tracks dip into the tunnel and you actually must climb stairs to get to the local tracks. The north exit is the main one, leading to Flatbush and Ocean Avenues while the south exit leads to Lincoln Road. Both fare controls are at street level with nice station houses at both ends with doors to street and trains. The Franklin Shuttle line uses primarily the northbound local track at Prospect Park for daily service. The southbound local track is usually used for storage but is occasionally for service reroutes during construction. The tunnel just north of this station is the location of the infamous "Malbone Street" wreck of November 1, 1918, New York's worst railroad accident. On November 1, 1918, due to a wildcat strike of BRT motormen, service was being operated by tower operators and other supervisory personnel. One such substitute operator was Edward Luciano, who was operating an evening rush hour Brighton Line train from Park Row to Coney Island. He was an inexperienced operator, and unfamiliar with the Brighton Line as well. At the junction of the Fulton Street El and the Brighton line at Franklin Avenue, he did not notice that the signal was set for straight ahead, and sped across the junction on Fulton Street. Realizing the error, he then backed up to the junction, and took his proper turn. Trying to make up time, he sped down the incline at such speed that he missed his stop at the Consumer's Park station. Due to the construction of the new subway connection at Prospect Park, the tracks, before entering the Prospect Park station now ducked into a subway tunnel, and then took a sharp reverse curve into the station. The curve had a speed limit of 6 MPH. Witnesses claim the train was going at least 30 MPH as it entered the tunnel. The front of lead car 726, an open platform El car, held the curve but the rear truck derailed. Second car, motorless trailer 80 and third car, motorless trailer 100, also derailed and smashed into each other, the rear of the lead car and the tunnel walls. Fourth car 725 and fifth car 1064, both motor cars, remained on the tracks. Car 80 had one of its sides and its roof torn away, and car 100 was completely destroyed to its floor, as the wooden cars banged against the tunnel walls and were reduced to splinters. In all, 97 people were killed (5 survivors of the crash died later for a total of 102), and hundreds were injured. Ebbets Field was turned into an emergency aid station. Motorman Luciano was able to walk away from the crash and was later found and arrested. Other BRT officials were also arrested and charged with manslaugher. In 1919, Luciano was acquitted and in 1920, the remaining BRT officials were also acquitted of the charge. The New York Times reports on the wreck the next morning. The site of the wreck, as seen in 1997. Photo by Constantino Tobio, Jr.
Oddly enough, a second accident at the same scene was recorded on December 1st, 1974. A train of R-32s traveling at slow speed derailed and hit the tunnel wall at the same place of the Malbone Street wreck. There were no deaths or injuries. From here to Coney Island, all the stations have crossovers or crossunders and common fare control for each direction. This station has two side platforms alongside four tracks. The station was partially renovated in the 1990s with new wall tile, new lights and artwork in the mezzanine, but the ends of the platforms retained the old decor of painted concrete walls, signs, and fluorescent lights. The south end of the platforms are inside a short tunnel structure. During early steam railroad operation the station was known as Woodruff Street [Avenue], and the southern secondary exit leads there today. This exit is unstaffed, with only HEET turnstiles. Express station with four tracks and two island platforms. The station has been renovated. The ceiling has longitudinal metal slats in an arched patterns. The main exit at the south leads to Church Avenue and features glass block windows. Outside the fare control is a sign that the station has been adopted by nearby Erasmus Hall High School. The north exit leads to Caton Avenue. Both fare controls are at street level with pleasant station buildings. There are crossovers at both ends. Unlike the nearby IRT station on the same road, the station name here is spelled Beverley, not Beverly. The exit at the north ends leads to the mezzanine at street level. The mezzanine is over the tracks and has a skylight. This station has been renovated with new lights and tile. Avenue H station lies at the transition point from open cut to embankment construction, and is a local station with two side platforms alongside four tracks. Avenue H isn't a "cross street" under the railroad; in fact the tracks are about 2m above the street level where it dead ends, as they ramp up between Newkirk Avenue and Avenue J. The station house, at street level on the east side of the railroad, dates back to the early Brighton railroad era, and resembles a residential house complete with porch! A passageway under the railroad connects to the southbound side platform. The platforms have full windscreening along their entire length. There was a former high turnstile exit on the downtown platform, walled off long ago for security purposes. In a final safety effort, a set of four lamps was installed. Now with the stairs out of use the lamps still shine. The station overlies the LIRR Bay Ridge line, which runs between Avenues H and I, near the turnoff from the LIRR Manhattan Beach line. The area around Avenue H is full of vestiges of the junction, including ramps in the LIRR trench, curved property lines along the turnoff, and the footbridge carrying E 18th St over the LIRR. Despite the proximity of the three railroad lines, there was never any effort to coordinate transfer between them. During railroad days the Avenue H station was named Fiske Terrace; A "Fiske Terrace Market" still exists at 1614 Avenue H just outside the station house. Avenue J is a local station with two side platforms alongside four tracks. At the platform level, Avenue J station closely resembles that at Avenue H, except that it has less of the windscreen treatment along the platform edges. A former high turnstile exit on the north end of the downtown platform led to the north side of Avenue J but has been closed for security reasons for many years. A view across the street from the station house reveals the abandoned stairway in a state of poor repair, with old light stanchions and evidence of a removed canopy. The station house here is underneath the tracks (instead of alongside as at Avenue H) and is essentially a tile and brick room directly under the tracks facing directly onto the streets. The tracks over the street form a natural roof for weather protection and a bus-stop shelter. Avenue J was known as "Manhattan Terrace" in the early railroad days. There doesn't seem to be a street of that name remaining but the neighborhood served by Avenue J station is still known in realty circles as Manhattan Terrace. Avenue M is a local station with two side platforms alongside four tracks. At the platform level, Avenue M station closely resembles that at Avenue J. Double-wide stairways from the platforms to the street-level access passageways lead into the station house, which is a brick building underneath the tracks facing onto the street. Avenue M was known as "Elm Avenue" in the early railroad days. From the train and the platform of Avenue M you see the tall landmark 'Vitagraph' chimney, on Avenue M just west of the railroad, way. Now part of a rabbinical school it was once the site of a prolific motion picture studio. The Brighton Beach line may have even been used for train chase scenes! Express station with four tracks and two island platforms. A tower is on an elevated structure over the south end of the station. There are three available entrance/exits: Quentin Road (south of station), the main entrance (south side of Kings Highway), and an automated entrance on the north side of Kings Highway. The main entrance had a station house very similar to that of the local stations, only a little more ample. It was totally replaced in the 1980s with the present open front forecourt. This station again resembles the previous stations at Avenues H, J and M. Evidence was found for a closed south exit. This station at Neck Road (originally known as Gravesend Neck Road on street maps) also resembles Avenue J. A recently renovated express station with four tracks and two island platforms. The old lights at the ends of the platform have been retained and modernized with vapor lights. The station platforms have a rustic appearance due to its surroundings and their location on an S-curve. At the south end exit (at Voorhies Road) is a brick station house, decorated with seashell accents, and includes a heated waiting area at street level. Curving over Coney Island Avenue, the next station is Brighton Beach, an express station. The express trains terminate here on the center tracks, while locals continue on to Coney Island. There is a crew room over the platforms near the south end. The north exit to Brighton 7th Street as well as the south exit to Brighton 5th Street have crossunders and are pretty boring: despite being renovated, there are no mosaics or artwork in the crossunders. At Brighton 7th Street there is an escalator from street to mezzanine. Another express station, however at this time only the two local tracks are in use for regular service. The exit to the east side of Ocean Parkway was nondescript, but the west side of Ocean Parkway exit, while closed, was nice, with checkerboard-style tile on the floor. The exterior of the station was recently totally rebuilt in a monumental style, with new concrete decoration and accent globes. The first station after departing Prospect Park is Botanic Garden, which opened in 1924 replacing an earlier station nearby called Consumer's Park, which had opened June 19, 1899 along with the rest of the Franklin line. (Vestiges of Consumer's Park can be seen on the right hand side of the line about 1/3 of the way from Prospect Park to Botanic Garden). This piece of the line runs thru the Brooklyn Botanical Gardens. The renovated platforms feature white tile with a lower tile band border of dark green, cream and red. The top tile band also features these colors plus a wide area of light green with bright cream diamonds followed by a tile band of red, cream and dark green. The new name tablet has a wide border of dark green, with bands of cream and red. The background of the center is light green (some pale yellow accent) with the name in white letters. The north end of the station is in a tunnel; the south end has a curtain wall between the tracks. The Botanic Garden station benefitted greatly from the 1998-1999 renovation of the Franklin line. In 1998, we observed the decayed wooden platforms at the south end of the station along with the decayed, abandoned, stairs to the street, both of which were wisely closed off due to large holes in the platforms. The south end of the station has evidence indicating the remains of the old platforms, especially on the southbound side where a large open space exists. The station has a crossover towards the middle of the two wall platforms. The mezzanine features the same tile pattern (but no name tablet), sodium lights, and the station exit up a short (14 steps) flight of stairs to the street. The station house is concrete with windows. The railing outside the station house has some oak leaves intertwined in a crisscross pattern. At the north end of the northbound platform is a new transfer passageway to the Brooklyn IRT's Franklin Ave. station. This passageway is brightly lit with fluorescent lights. The passageway takes a jog to the right after about 5 feet and another jog to the right after about another 30 feet. Four steps are seen after another 5 foot distance and lead to a mezzanine at the north end of the IRT which is 18 steps below. This mezzanine is laid out in a half hexagon pattern, with the straight side being the entry from the shuttle. Heading north from Botanic Garden the shuttle line passes through a round brick tunnel which has compact fluorescent lights and newly cleaned brick. The tracks then rise to a low embankment and then to an elevated structure at the next stop, Park Place. Prior to the 1998-1999 renovation, Park Place had one island platform, made of very springy, spongy plywood, and two tracks. This platform had already been cut back and the north end demolished. Site observations indicated a removed/closed entrance further north past the supports for the removed platform. A small headhouse at the south end of the platform contained a couple of turnstiles, and was the last station in the system to have had token-accepting turnstiles installed. Even as recently as the 1960s there was only one turnstile that was attached to the token booth. You would pay the clerk, and then walk through. The 1998-1999 renovation converted Park Place from an island platform station to a side platform station with a single track on its west face. Riding a train northbound, the two tracks merge with just the original northbound track remaining. The line is single-tracked from here to Franklin Avenue. The structure for a second track remains in place. The south end of the new single platform features a platform level fare control with sodium lights and windows. The mezzanine features the same three colors introduced at Botanic Gardens. There are bright fluorescent lights on the platform which has no windscreen. There are 5-foot ornamental wrought iron railings, and a chain link fence behind. The fence protects the street crossing underneath the south end of the platform. The north end of the station has a unique feature for the subway-- ramps to the street. The ramp features a pleasant ornamental iron railing and lead to the emergency room of Interfaith Hospital. A stairway is also present. This station was closed in 1996 partly because of its decrepit condition (although it seemed that the concrete portion of the platforms were in better shape than the plywood platform at Park Place) and partly because of its low fare collection (many riders simply jumped the turnstiles). After the station closed, the stairs to the street were removed along with the fluorescent lights from the platforms. The rest of the structure was removed during the 1998-1999 renovation of the Franklin line. Not much trace remains today. The New York Times wrote upon the closing of Dean Street: "By the Transit Authority's count, Dean Street was, by a wide margin, the least-used of the city's more than 400 stations, with an average of just 82 tokens a day collected last year..... The station holds other distinctions as well. It is one of the city's most decrepit -- with gaping holes in its weather canopies and rust flaking from its supports -- on an elevated line whose physical condition has been an embarrassment to generations of transit officials." - New York Times, "A Subway Station Is Shuttered, the First in 33 Years", September 11, 1995. 1998 Observations. We are now shifted over to the west (southbound) track and enter Franklin Avenue, the last stop. The station has two side platforms but the "northbound" track here has had part of the rail removed, leaving a single track in place. All trains therefore use the "southbound" track. At one time a temporary wooden platform existed over the northbound trackway but this has long since been removed. The southbound track is blocked at a bumper about two and a half 75'-car lengths from the south end of the platform, leaving another two car lengths to the end of the platform and fare control. The station still has the original ornamental railings along the platform and fare control area. The fare control is at the north end of the station. Access to the street is via a crossover to the northbound platform and then via temporary stairs to the street. The station used to have an overpass from the fare control over Franklin and Fulton but this was removed as a prelude to the renovation of the line. Transfer can be made to the IND 8th Ave./Fulton Line by obtaining a paper Metrocard transfer, which is issued from a machine that resembles a bus farebox near the token booth. The transfer is good for twenty minutes only and can only be used to enter the IND station. The transfer Metrocard is swiped at the turnstile and is then useless (most are discarded all around the platform area, making quite a mess). The old paper transfers are used as a back-up system if the Metrocard dispenser is out of order. 1999 Observations. The north end fare control area has been rebuilt. On the east side, there is a soaring three-or-four story high atrium, with the fare control at street level 33 steps below. This area has frosted plexiglass windows and artwork in stained glass at platform level. An escalator is also present here. This area is brightly lit with sodium lights. We then have a choice of exiting to the street, or descending 33 steps to the IND Franklin Ave. station, Rockaway-bound side, via a free transfer (no more paper or Metrocard transfers required). On the west side, there is a stained glass artwork, and a stairway down 24 steps to the bridge over Fulton Street. The bridge has enclosed sides (no glass), and after crossing Fulton Street we descend 60 steps to the IND Franklin Ave. station, Manhattan-bound side. There is no access to the street from the bridge or stairs. The north side of Fulton Street also has a direct entrance to the IND on the northeast corner. The main fare control for the entire complex, therefore, is now at the base of the atrium, instead of at the Franklin Shuttle platform level (for the shuttle), and on each side of the Franklin Ave. IND station. The rebuilt station is fully ADA compliant and has four elevators tying it all together: One, from the street-level fare control to the shuttle atrium side; two, from the street-level fare control to the Rockaway-bound IND; three, from the street level fare control to the Fulton St. overpass level; four, from the Fulton St. overpass to the Manhattan-bound IND. Thanks to the reconstruction there is finally a crossover between the two directions of the IND. The old platform level fare control has been removed on the Rockaway-bound side, the area having been widened to allow the free flow of passengers to and from the shuttle (via the stairs and elevator). The Manhattan-bound side has also been widened, but a booth remains, allowing entry from the street without having to use the bridge. By Mark S. Feinman, Peggy Darlington, David Pirmann, Robert Weinstein and Zach Summer. History originally by Robert B. Weinstein, posted to rec.railroad 7-May-1994.